It's summer month but looks like the weather isn't ready to switch just yet. The heavy rain is threatening. Classes has been cancelled several times. 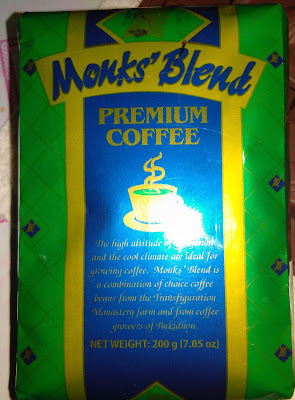 And when it's cold around I have this to keep me warm... Monk's Blend Premium Coffee. Whether I'm exploring guitar center music store or on with my research paper works, it'll always make a perfect buddy for me. From its name the coffee is especially made by Benedictine Monks. They are whom we spent time with for three days when we've had our Teachers' Annual Retreat this year. We were never shown the process of how this good-smelling coffee is made (maybe because we didn't ask) but have we been offered, I would definitely love to see. Browsing the web a lot of sites present loads of health benefits of coffee. Am I drinking for any of those reasons? No...the only reason why I drink coffee is because is because it makes me feel good. And as to the benefits...they're probably just a bonus. I often heard people say "never leave Digos (name of the place) without dropping by the Benedictine's Souvenir Shop". It is just along the highway so anyone can stop and help themselves with these goodies.